I removed the old solar panels (forgot that I glued them with Sikaflex!). Karate-kittet the old glue off and mounted three new ones. After eight years of good duty the old ones were dead, leak, water sipped in and frozen to breakage. Took me half the day to have the new ones work and charge batteries with a solid 4.8A and more. Ian (Wittevrongel) came by to stitch a batten pocket. Always good but especially nice to have Ian on board. Good chat, good work. He’ll make me a genoa cover to protect that sail from sunlight when berthed in Scheveningen next season!? Did some shoppings for the race; 2kg of cashew, 18 bottles of water, 12 bottles of (very) light sparkling, # tins of Tuna, Mars, Chips, Ice Tea, Gini, and a lot more. Eggs, Bacon, Salami. A new startmotor feels better regarding the necessary daily battery charging at 6am and 6pm. Bed linen washed and brand new pillows!! Ready to go! Sunday august 3rd around HW Nieuwpoort which is at 6:20am. 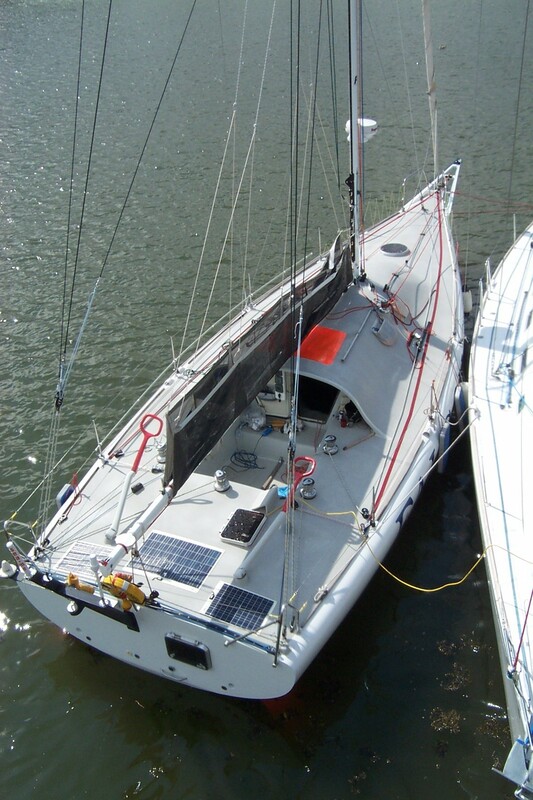 This entry was posted in Uncategorized and tagged solar panels. Bookmark the permalink.